Properties in Hesse average 4.4 out of 5 stars. Take a vacation where even the Rhine pauses! 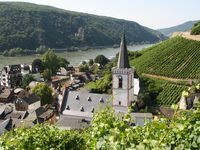 Property 17: Take a vacation where even the Rhine pauses! Single standing top equipped house for up to 14 people. Property 18: Single standing top equipped house for up to 14 people. Pure nature: Apartment 'Wildcat' at 'Frau Holle' (Mother Hulda), dogs willk. Property 31: Pure nature: Apartment 'Wildcat' at 'Frau Holle' (Mother Hulda), dogs willk. Renovated apartment in a good residential complex in Solms in the beautiful Lahn valley. Property 34: Renovated apartment in a good residential complex in Solms in the beautiful Lahn valley. For nature lovers! Simple and rustic in Diemelsee-Heringhausen, 1A location! Property 42: For nature lovers! Simple and rustic in Diemelsee-Heringhausen, 1A location! Apartment with whirlpool & fireplace, free Wi-Fi - wellness area use incl. Property 48: Apartment with whirlpool & fireplace, free Wi-Fi - wellness area use incl. Beautiful, clean, quiet, wonderful view! We had a wonderful time staying here. The host, Jana, was very attentive and made sure we had everything we needed for a comfortable stay - spare toiletries, a variety of snacks and drinks, and a very well-outfitted apartment. The apartment is very close to a train stop and grocery store, making it very easy to get downtown or any of the points of interest in Kassel. I would completely recommend this to anyone looking for a place to stay in Kassel - you won&rsquo;t find anything more wonderful than this!